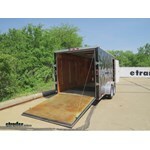 Lowest Prices for the best trailer cargo organizers from Rackem. 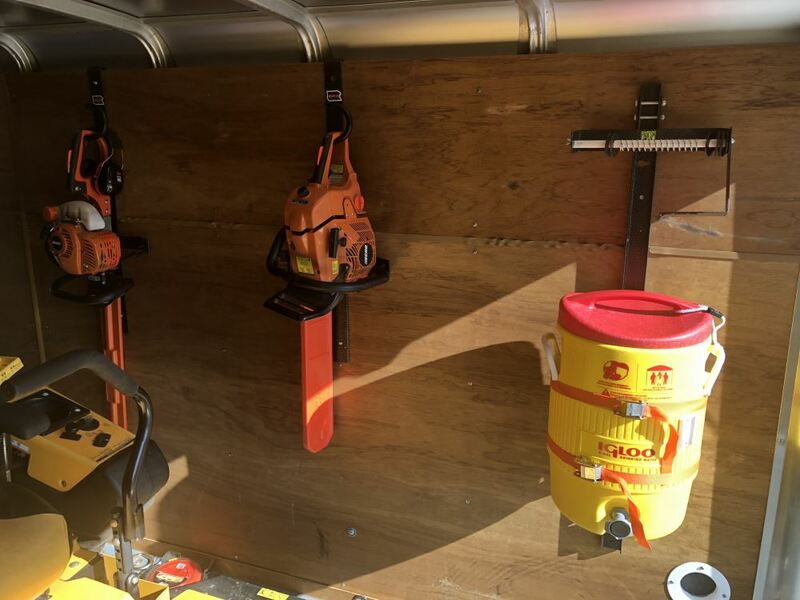 Rack'em Hedge Trimmer Rack for Enclosed Trailers part number RA-3 can be ordered online at etrailer.com or call 800-298-8924 for expert service. 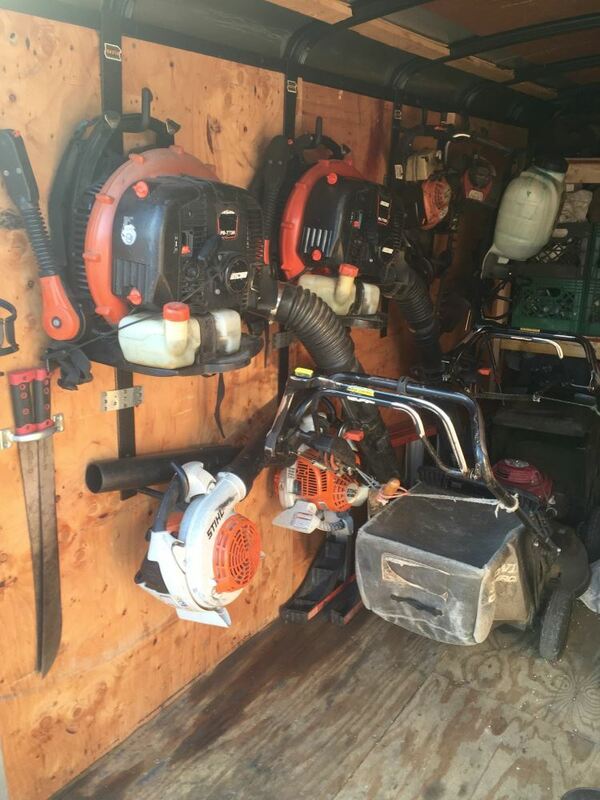 Today we're going to review part number RA-3 this is the Rack'Em Hedge Trimmer and Chainsaw Rack. 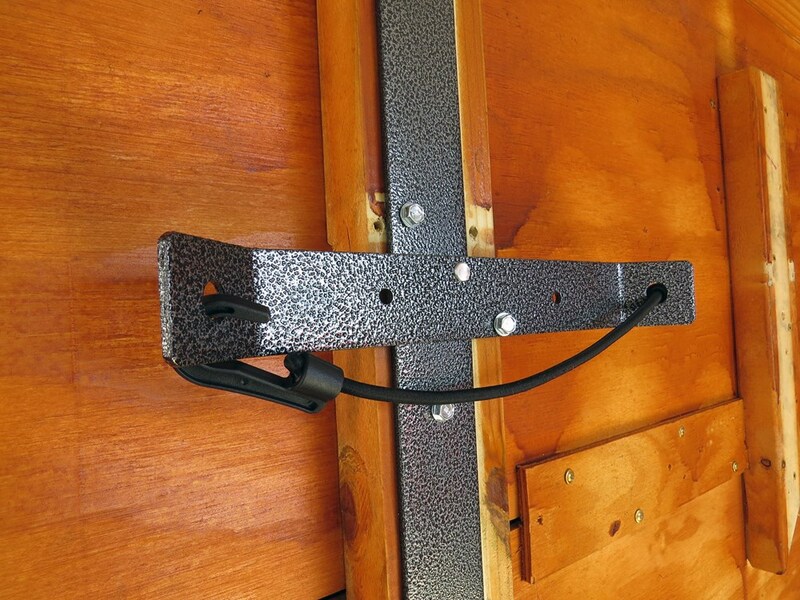 This part is designed to hold a hedge trimmer or a chainsaw by their loop handles. You just put their handle right on the loop here, that's welded to the top here. This will also hold almost any similar tool that has a loop style handle. The nice thing on this bracket if you notice it has a hook right here on the end, at the top of the rack. 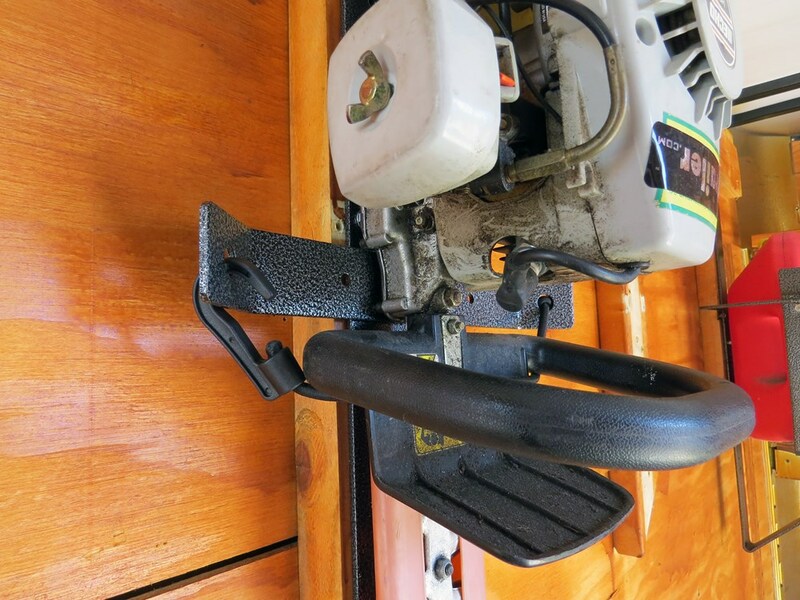 This will allow you to hang the tool from the metal frame runner at the top of the side rails on your trailer for added strength. 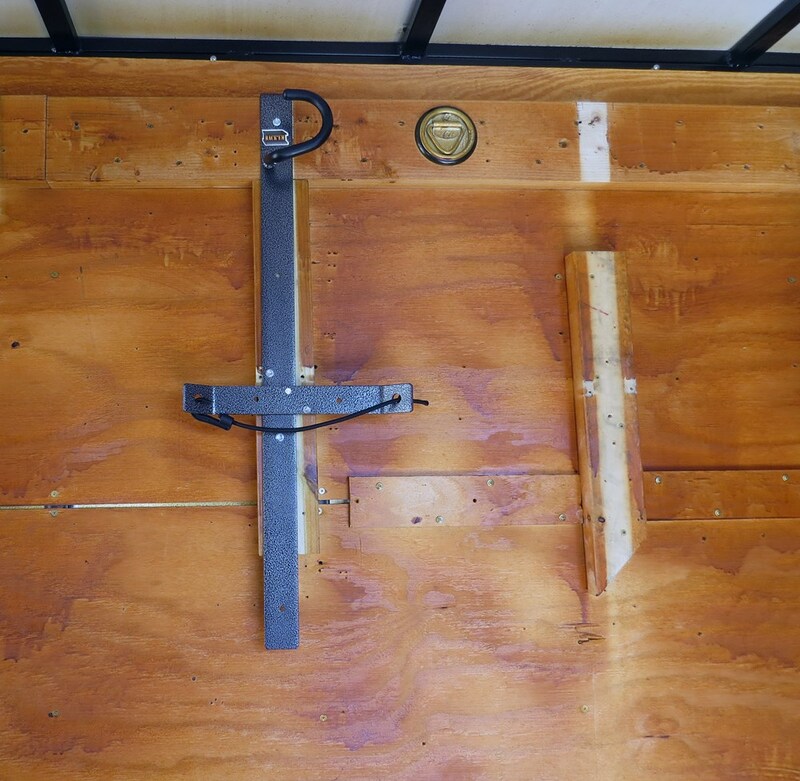 The rack was also pre-drilled with holes so that can be screwed securily to the wall. 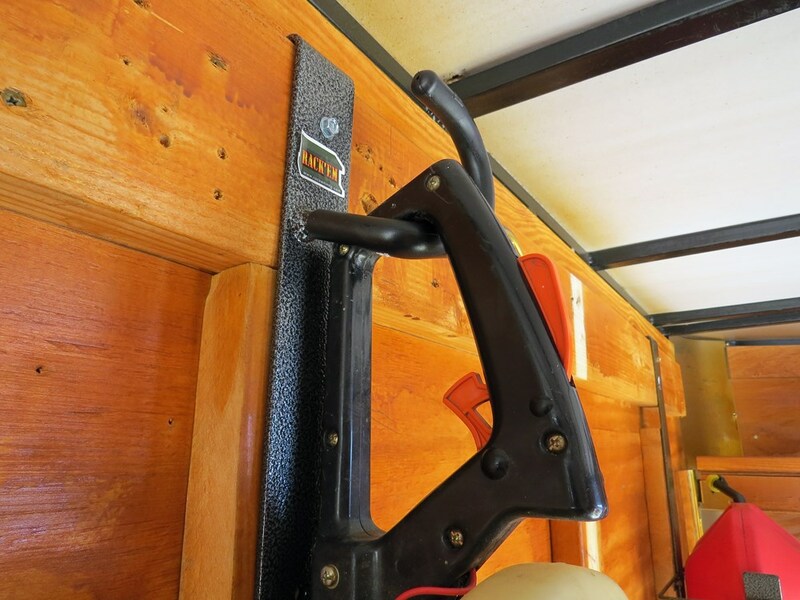 When you go to install this in your enclosed trailer you would just hang this on the very top metal frame runner. 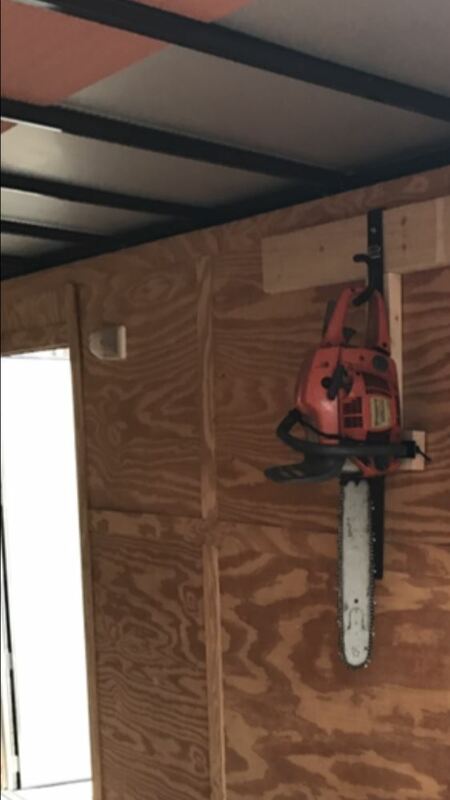 As it hangs down you can screw it into the side wall of the trailer. The cross member right here does rotate. You just pull it out, line the whole up, this cross member will support the tools engine up against it and it secures the unit with this included bungee cord that you wrap around it to hold it into place from flopping or moving around	The extended portion down here of the rack provides a rest for the cutting bar of the tool and will prevent damage to the wall of your trailer. 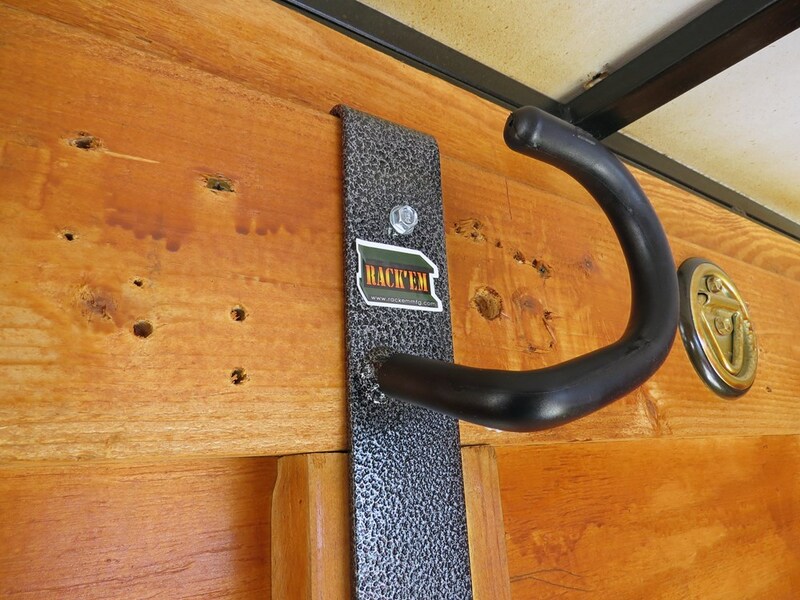 It does have a nice durable hammered paint finish that looks very good and will hold up for many years. Just to give you a few measurements on the total length. From the top to the bottom of this rack is going to be right at 34 inches long. The width with this cross member extended completely out, end to end, is going to be right at 13 inches wide. 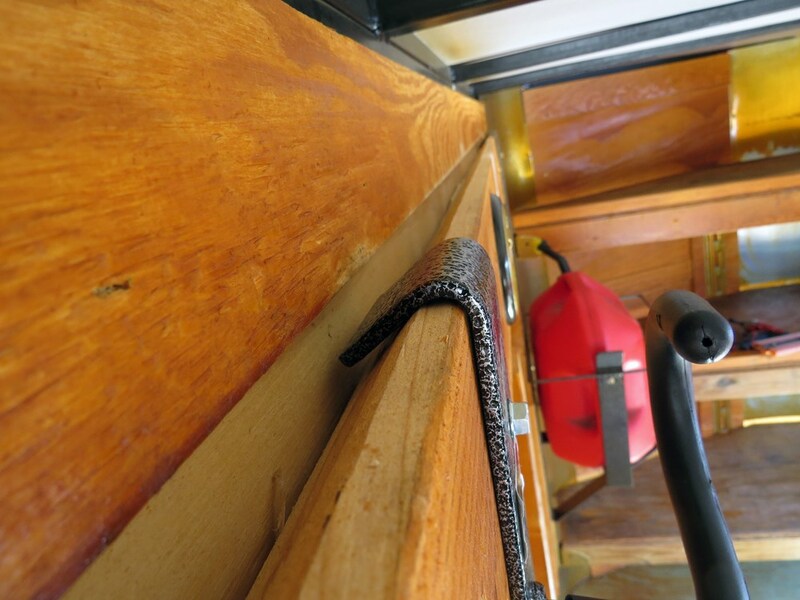 Again, the nice hook up at the top here, is a nice rubber coated finish to protect the handle of your tool. That should do it for the review on part number RA-3. 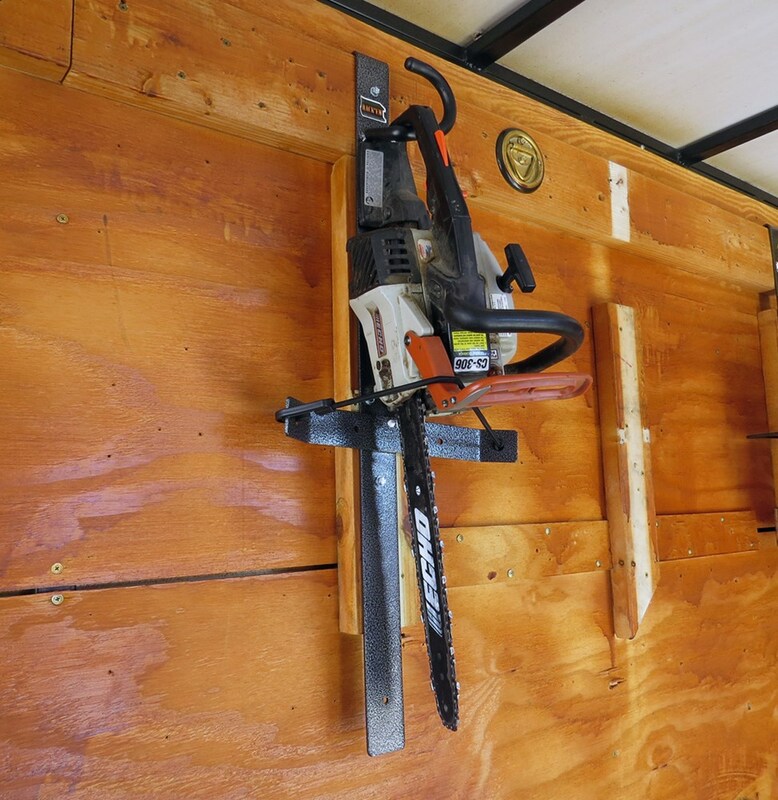 This is a Rack'Em Hedge Trimmer and Chainsaw Rack. 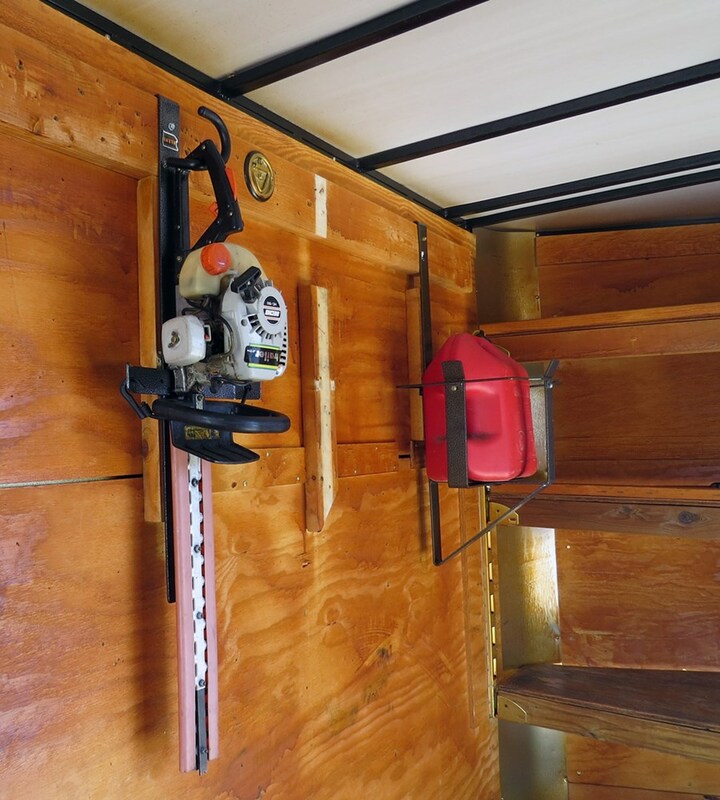 The dimensions of the # RA-3 hedge trimmer or chainsaw rack are 33-1/2 inches overall length by 13-3/8 inches wide. 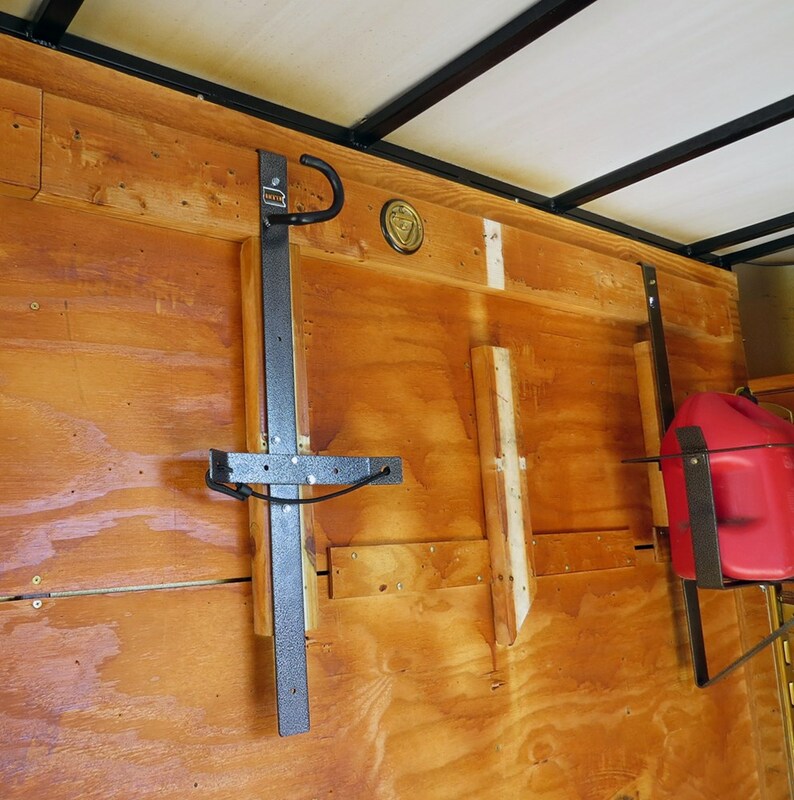 From the hook where the handle would hang to the center of the cross bar with bungee the measurement is 13-3/4 inches. 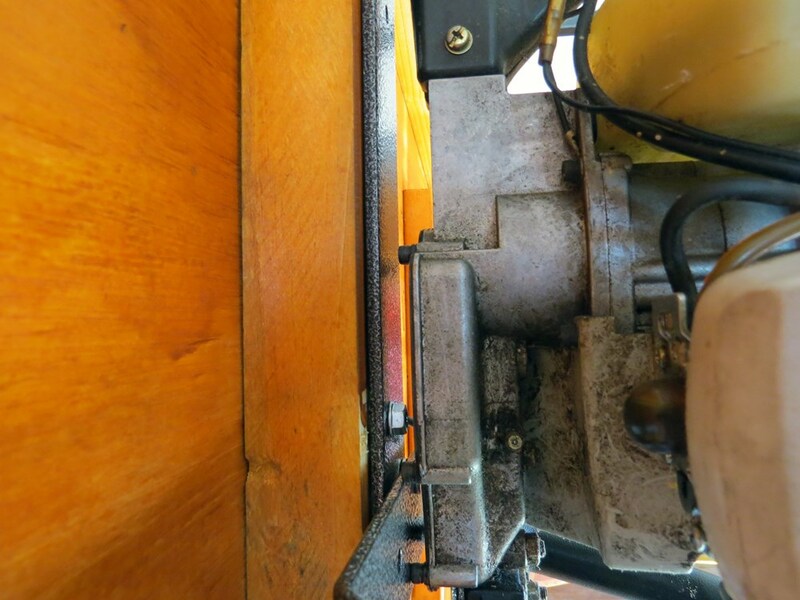 There are also several mounting holes in the rack starting at 2 inches from the top, then 12 inches, 19 inches and finally 31-3/4 inches. I produced a short video showing the dimensions of this rack for you to review, see link.